Linkin Park kept it short and simple for 2005. After touring extensively for Meteora, the band took a year off to be with their families and work on side projects. Fort Minor got its start in 2005 and Chester worked on Dead By Sunrise. The band played a show in Anaheim for Music For Relief: Rebuilding South Asia and had several guests come out. After playing three hits, Chali 2na came out and joined them for "Frgt/10", which was the first time it was ever played. Then, after an outro into "Breaking The Habit" and then "Crawling", Jay-Z came out and they went through all six Collision Course hits. This would be the third time Jay joined them for the collaboration onstage. 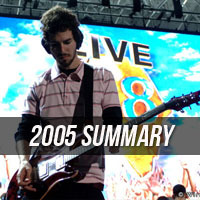 LPLive was able to finally get a copy of this very sought-after show and release it in 2012 - be sure and check it out! In July, Linkin Park played a concert for Live 8 in Philadelphia, after Bono from U2 personally invited them to join the lineup. They played "Crawling", "Somewhere I Belong", "Breaking The Habit", and "In The End", followed by Jay-Z coming out for his own song "Public Service Announcement", and then the first four songs from Collision Course. This would be the first time the band never closed with "One Step Closer"!